OSKALOOSA, Iowa (August 7, 2018) – Jumping into the Tony Stewart Racing #14 for the first time didn’t phase Lemoore, California’s Carson Macedo at Tuesday’s Sage Fruit Ultimate ASCS Challenge presented by Searsboro Telephone Company. The young driver has been making getting into new cars old hat this week, and Tuesday was no different, as he took home the $4,000 prize. Kevin Thomas Jr. took an early lead and held on to win the POWRi WAR Wildcard Non-wing Sprint feature. The first non-wing event held at Oskaloosa paid the Cullman, Alabama driver $2,500. The 25-lap ASCS feature saw Willie Croft take the point early over Macedo and Jonathan Cornell. Gio Scelzi slowed and brought out the caution with one lap in the books. John Carney II showed speed early, and moved up to fourth on the restart, before fifth running Jack Dover performed a 360 spin and came to a stop two laps in. It would prove to be the last caution of the race. Completing the first lap when the green fell again, Macedo rode the high side of the track to take the lead from Croft. Good racing behind the leaders, saw Carney and Wayne Johnson shoot into third and fourth, with Seth Bergman advancing into the top five on lap six. By lap nine, Macedo was dicing through traffic. A lap later, Johnson passed Carney in a great battle for third. Carney was sticking to the bottom of the half-mile and cruised back past at the halfway point. Blake Hahn was advancing as well, taking fourth (after starting in row seven) with ten to go. 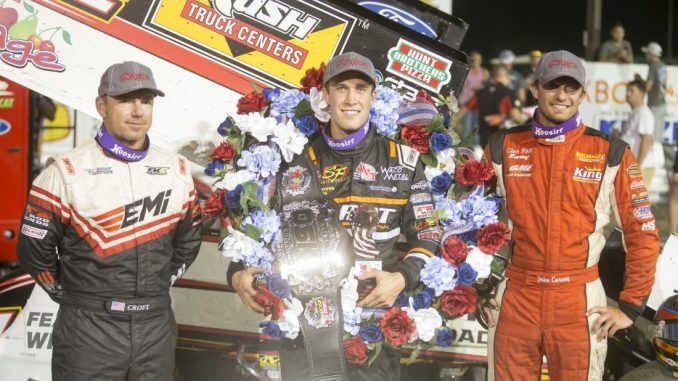 Up front, Macedo would not be challenged in taking his first career ASCS National win. Carney would move into second over Croft, Hahn and Trey Starks. Johnson, Johnny Herrera, Bergman, Paul Nienhiser and hard-charger Shane Golobic rounded out the top ten. Herrera, Bergman and Croft were heat winners, while Sam Hafertepe Jr. won the B mani. 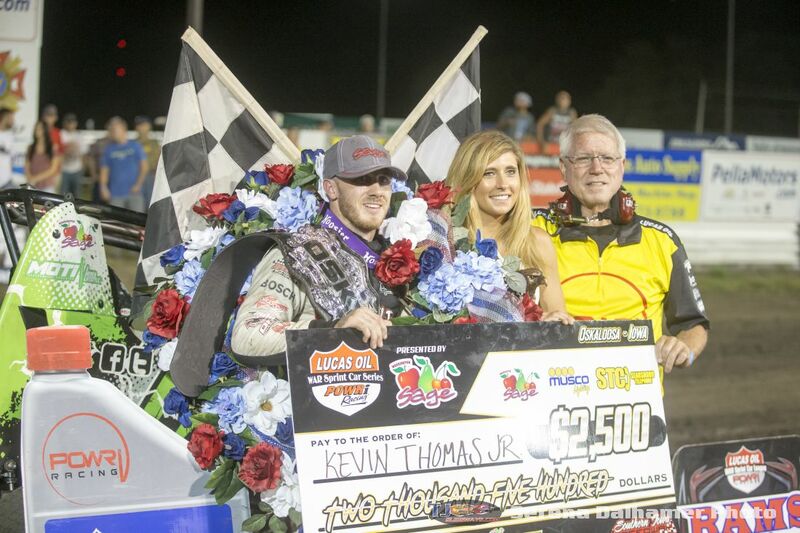 Kevin Thomas Jr. took the lead in the POWRi WAR Wildcard Non-wing sprint feature on the third lap and never looked back to claim that feature. Katlynn Leer was a flip victim before a lap could be completed. Isaac Chapple led the first two laps, but Thomas would claim second from Dylan Kadous on lap two and cruised the bottom to get by Chapple on lap three. From there, Thomas, aboard the Bernie Stuebgen Indy Race Parts #71 he will be piloting at the Knoxville Nationals, would never be challenged. Great racing was going on behind him, however. Riley Kreisel would claim second after starting tenth in the field. Zach Daum would make a steady progression forward to complete the podium. Chapple and Landon Simon would follow. Mario Clouser, Korey Weyant, Logan Faucon, Donovan Peterson and hard-charger Brad Wyatt would complete the top ten. Thomas, Daum and Chapple won heats. The first heat got off to a rough start when Austin Sears got sideways, and collected a number of cars. It would end the nights of Mitch Wissmiller and Brandon Stevenson, while Leer and Thomas would return to action later. Sage Fruit Ultimate ASCS Challenge Main Event (started), 25 laps: 1. 14, Carson Macedo, Lemoore, CA (4) 2. 7, John Carney, El Paso, TX (6) 3. 29, Willie Croft, Roseville, CA (1) 4. 52, Blake Hahn, Sapulpa, OK (13) 5. 44s, Trey Starks, Puyallup, WA (10) 6. 2c, Wayne Johnson, Tuttle, OK (8) 7. 45x, Johnny Herrera, Albuquerque, NM (7) 8. 23, Seth Bergman, Snohomish, WA (5) 9. 9x, Paul Nienhiser, Chapin, IL (9) 10. 17wx, Shane Golobic, Fremont, CA (20) 11. 2, Bill Balog, Hartland, WI (18) 12. 15H, Sam Hafertepe Jr., Sunnyvale, TX (17) 13. 3s, Sammy Swindell, Germantown, TN (16) 14. 28c, Jonathan Cornell, Sedalia, MO (2) 15. 99, Skylar Gee, Leduc, ALB, Can. (22) 16. 17w, Harli White, Lindsay, OK (14) 17. 1, Travis Rilat, Heath, TX (25, prov.) 18. 3, Nate Van Haaften, Otley, IA (21) 19. 4, Jon Agan, Knoxville, IA (11) 20. 44, Chris Martin, Ankeny, IA (19) 21. 13JM, Jordan Martens, Sioux Falls, SD (15) 22. 53, Jack Dover, Springfield, NE (3) 23. 28, Scott Bogucki, McLaren Vale, SA, Aust. (24, prov.) 24. 71x, Gio Scelzi, Fresno, CA (12) 25. 95, Matt Covington, Glenpool, OK (23, prov.). Lap Leaders: Croft 1-2, Macedo 3-25. KSE Hard-charger: Golobic (+10). $500 BMRS “Back it Up” Award: Cornell. Snap-On Mechanic of the Race: Jimmy Carr. A main (started), 25 laps: 1. 71, Kevin Thomas Jr., Cullman, AL (5) 2. 90, Riley Kreisel, Warsaw, MO (10) 3. 5D, Zach Daum, Pocahontas, IL (4) 4. 52, Isaac Chapple, Willow Branch, IN (2) 5. 24, Landon Simon, Brownsburg, IN (3) 6. 6, Mario Clouser, Auburn, IL (7) 7. 99, Korey Weyant, Springfield, IL (14) 8. 52F, Logan Faucon, Elkhart, IL (9) 9. 19, Donovan Peterson, Brookings, SD (13) 10. 41, Brad Wyatt, Kearney, MO (19) 11. 22, Brian VanMeveren, St. Paul, MN (11) 12. 12G, Kelly Graham, Hedrick, IA (12) 13. 11, Frank Rodgers, Lucas, IA (17) 14. 20, Steve Thomas, Rantoul, IL (15) 15. 55J, Jason Pardock, Melrose, IA (18) 16. 56, Mitchell Davis, Auburn, IL (6) 17. 31x, Dylan Kadous, Topeka, KS (1) 18. 7, Clinton Bruns, Little Rock, IA (8) 19. 77K, Katlynn Leer, Moulton, IA (16) DNS – 22s, Slater Helt, Harrisonville, MO, 31, Austin Sears, Macomb, IL, 1, Mitch Wissmiller, Saybrook, IL, 0, Brandon Stevenson, Holstein, IA, 22m, Shawn Miller, Jacksonville, FL. Lap Leaders: Chapple 1-2, Thomas Jr. 3-25. $100 bonus to All Starters from All-Pro Performance. Hard-charger: Wyatt. Brian Brown Repeats as Front Row Challenge Champion!